Note : Free entry for children below 12 years of age. Event Description : Genesis Foundation’s flagship event Kasauli Rhythm &amp; Blues has now made its entry into Delhi as Genesis Foundation’s Rhythm &amp; Blues Festival 2017. The Seventh edition overall and first one in Delhi would be a two day long music fiesta, that is charted to be organised on November 4 and 5, 2017 at the lush lawns and amphitheatre of The Zorba situated in Mehrauli-Gurgaon Road. The new edition will bring in a line-up of popular Indian artists from across genres. 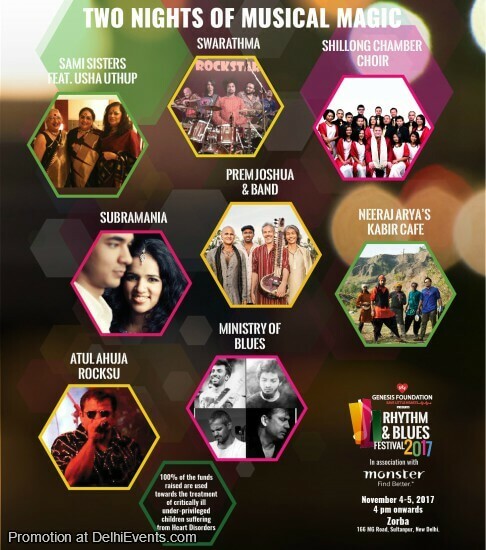 The two-day event promises a range of power-packed performances from bands like Neeraj Arya’s Kabir Café, Prem Joshua &amp; Band, Ministry of Blues, Shillong Chamber Choir, Swarathma, SubraMania, Atul Ahuja RocksU and The Sami Sisters feat. Usha Uthup. The festival is especially curated for a community of festive goers who want to enjoy two days filled with music that resonates with good will and the need of making a difference by saving little hearts. 100% of the funds raised are used towards the treatment of critically ill, under-privileged children suffering from Heart Disorders. “ Music is a great unifier and we use it to draw people from varied backgrounds. It is the goodness of all artists who have come to support us that we are able to bring together music festivals like this. It is because of them that we can organise The Rhythm and Blues Festival 2017 for the first time in Delhi and save lives for critically ill underprivileged children suffering from Heart Disorders. We have a great line-up for all music enthusiasts which finally translates into a lot of hope for little hearts who are waiting for another chance to beat.” Said Prema Sagar, Founder Trustee, Genesis Foundation. The festival is headlined by established Bands &amp; Artists. Attendees buy donor cards and proceeds help the underprivileged. This Music Festival was conceived by Genesis Foundation in 2012 with a view to grow its community of donors and well-wishers. Believing strongly that music is a positive and participatory force in the creation of change, the Foundation invites established and upcoming artistes from India’s diverse pool of musical talent to perform in support of the critically ill under-privileged and orphan children under its care. Music aficionados can contribute for the cause by simply doing what they love – listening to music!